El Nido is one of the most beautiful places we've ever been to. Lazy palm trees swing over white sand beaches next to an ocean of pure blue. We think it's safe to say that the beaches in the Philippines are even better than the beaches in Australia. Nevertheless, we still had some awful days in El Nido, and have no one to blame but ourselves. 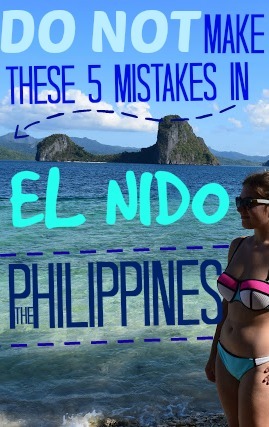 Luckily you can make use of our misery by reading these '5 mistakes not to make in El Nido' (and by not doing them yourselves)! El Nido is famous for its ABCD tours - four separate tours that take you to the best beaches and coves off the coast of Palawan. Unfortunately, we never made it on a single tour. Firstly we made the mistake of trusting a certain tour guide, who agreed to take us in three days, but didn't, and thus wasted three days. Then we had severely bad food poisoning which put us out of action for the rest of our time in El Nido. Luckily there are lots of other amazing things to do in El Nido that aren't the ABCD tours, so we did them and not going on the tours didn't ruin our trip. We've heard mixed reviews about the ABCD tours anyway - most say that it's really expensive for the service you're given, but the beautiful sites make up for it, even if they are a bit too touristy nowadays. We'd love to have made a decision for ourselves though - next time El Nido! We'd heard the (incorrect) rumour that there is no cash machine in El Nido, so we tried to take out enough money for our time there beforehand in Puerto Princessa. This itself was a problem: most of the banks wouldn't take our international cards, and then my card got blocked because even though I'd told the bank I was abroad, apparently no one in their right mind would go to Puerto Princessa so it still blocked me. When we finally found a bank that would work for us we found a crazy limit on our card (about £100 per day). We'd planned to spend two weeks in El Nido, but £100 wasn't going to be enough for two people. Compared to other South East Asian countries like Vietnam, Cambodia and even Thailand, we found the Philippines to be expensive. This put a downer on our trip, we wanted to have massages by the beach, eat delicious meals, have cocktails whilst the sun went down, but because we didn't have enough money, we couldn't do these things. Okay, this wasn't the end of the world, but we'd got used to this lifestyle in Asia. and then found out that the air-con wasn't allowed to be on between 10am and 4pm. Most days this wasn't a problem, as we were out enjoying El Nido during these hours. But when we had food poisoning it was a nightmare, we couldn't move from the room (apart from running to the toilet) and it was so hot and horrible. Take away lesson: pre-book the first couple of nights so you're not stressed when you get there, but then go and look round the hostels and pick one you like for your next few nights. And don't even bother with Novies!! Yea I hear you, if you're in a place that looks like paradise you shouldn't care about the internet bla bla bla. We're not messing around on here, the internet is how we make a living. We're not trying to get a good Instagram photo to make people jealous (well okay maybe a little), but it's more than that, if we don't get that insta-good shot, we don't get paid. Wrongly or rightly, the internet is very important to us, and as so many Filipinos are active online, and we get a lot of YouTube and blog traffic from the Philippines, we'd wrongly assumed the internet would be good. We were thinking the internet would be as good as it is in Thailand (where it's excellent). In Manila the internet is actually pretty good, and even in Puerto Princessa it was reasonable. In El Nido it was practically non-existent. So yeah, either we shouldn't be so dependent on the internet and/or we should have taken a break from work and enjoyed our trip in El Nido properly. Take away lesson: go there for its beauty and to get away from using the internet, not to be a digital nomad. I've already mentioned food poisoning a few times, but it deserves it's own section because it was the worst thing about our time in El Nido. And like all the other points, this was our own fault. When we first got to South East Asia we were really diligent about following our 'don't get food poisoning rules': we didn't have drinks with ice, we didn't eat meat or rice where we couldn't see it being cooked (and thus thoroughly heated) etc. By the time we got to the Philippines we'd become really blase about these kind of rules and hadn't really thought about it. At Merimegmeg beach we ate rice and chicken where we hadn't seen it being cooked and then finished it off with a cool iced drink. 6 hours later, we had the worst food poisoning of our lives: both ends. It was awful. But our own fault. Take away lesson: learn a few rules about how to avoid food poisoning and stick to them. If we got the chance to go back to the Philippines we would take it in a heart beat. It's one of the most beautiful places in the world and most of the Filipinos we met were absolutely lovely: kind, friendly and just so happy!! 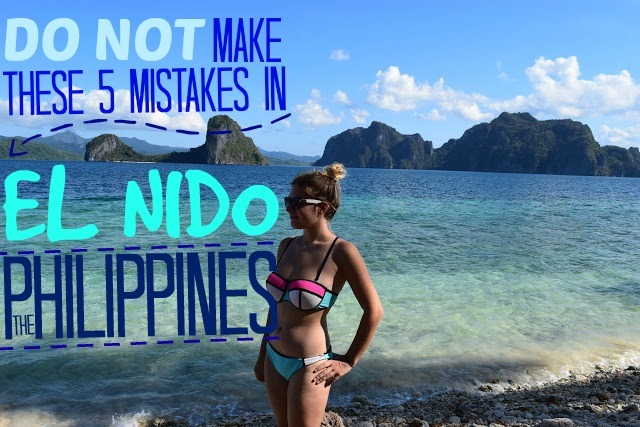 All the mistakes we made in El Nido were our own fault - either we were being stupid or we were being entitled which isn't cool and is something we are working on. We just hope that you can take something away from these lessons and have the perfect time in El Nido!! What are the worst mistakes you've made on holiday?